After walking around the city a little bit and in the middle of trying to do some pseudo holiday shopping, we stopped by the Black Sheep for some much needed foodage. I’m not sure how I’ve never been here before, but I guess I just never got around to it. I had heard very positive things about it. 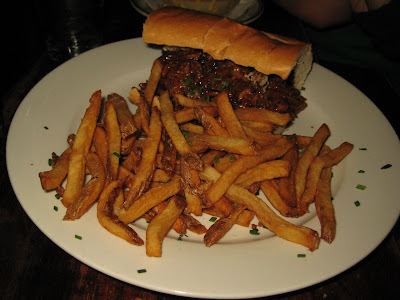 S got the pulled pork sandwich. Yeah, it’s a pretty big sandwich and bit cumbersome to eat. As S found out, it’s just easier to go with knife and fork instead of trying to keep it in sandwich form. I stole some fries towards the end of our visit. They’re quite good. 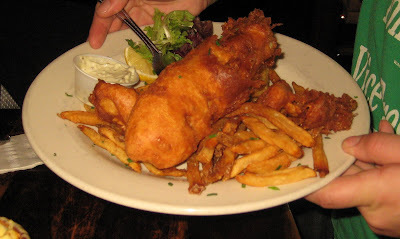 Behold one of the most impressive fish and chips dishes you’ve ever seen. Yes, that piece of cod is as big as it looks. And it’s Guinness battered. It should be rated NC-17 or something. J got the shepherd’s pie. And he said he’s never had shepherd’s pie before. Who’s never had shepherd’s pie? Even I’ve had shepherd’s pie before, and this is coming from a girl who grew up eating rice and kimchi most of her life. I love me some shepherd’s pie!!! Other than the carrots and celery in this one, what’s not to like about it? Meat, veggies, and mashed potato. Yum. 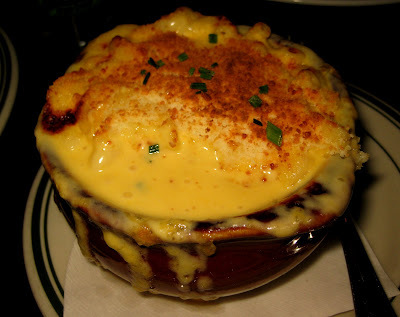 To this day, the best shepherd’s pie I’ve ever had is in some random family restaurant in Vermont. Don’t know the name of the place or what town it’s in, but I know how to drive there. This is a fact. I went the small plates route and got a bowl of the potato and leek soup and the mac & cheese. The soup was excellent. 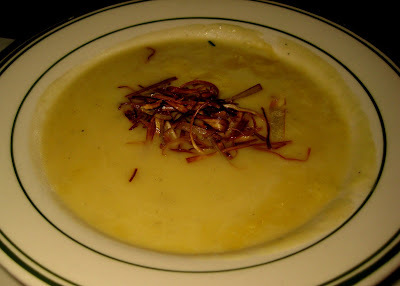 It was basically a potato soup with some deliciously fried leeks on top. Once mixed together, it was the perfect complement to the potato. The mac & cheese was a bit on the liquidy side, but still delicious. Really hot and really tasty. Service was good and considering how cold it was outside, we were extremely happy how well heated the place was. They play really random music though, or maybe it’s that the jukebox has random songs. And they play it a bit too loud. We had a great time, I’ll definitely be back!